Any professional user acknowledges having the necessary powers within his organization to accept these terms and conditions. The publisher of the site makes available to the user a large content. He constantly makes sure to put the means at his disposal to ensure the quality of these contents. However, it is up to the user to ensure the relevance of this information in view of his situation. The user therefore undertakes to use the information under his sole responsibility and releases the publisher from any liability in this regard. Thus, the publisher will in no way be held responsible for an accident that occurred to one of the users during one of the exercise sessions. The user before practicing the recommended exercises undertakes to have in his possession a recent medical certificate of no contraindication to the practice of the recommended activity. The user agrees not to disrupt the operation of the https://karate3g.com/ service in any way. In particular, the user agrees to refrain from posting illegal, defamatory or insulting messages on all or part of the site. The user also agrees to provide truthful, accurate and complete personal data. The publisher informs the user that cookies may be installed on his browser. In any case the user can freely delete them from his browser. You are informed that the publisher has an affiliate relationship with all the providers of goods and services that he refers to on this site, and that he may receive compensation when you purchase a good or service from that supplier by way of by a link on this site or in one of the mails you receive. I will not recommend you never a product that I do not sincerely consider to be a product of good quality. I have a reputation to maintain, and I want to bring you the maximum value! This site is the exclusive property of Bruno Bandelier SAS. The director of the publication is Bruno Bandelier. 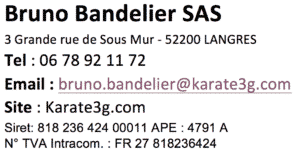 The Karate3G ™ training platform de Bruno Bandelier is made available according to the terms of the Creative Commons Attribution-NonCommercial-No Derivative 3.0 License. Based on a work by karate-blog.net ™. Permissions beyond the scope of this license can be obtained here: https://karate-blog.net/contact/.